Let me first say that I don’t usually enjoy reading financial planning books. Don’t get me wrong. I do read them, because I know that I need the information contained in them. I just don’t enjoy the process, finding that many are bogged down with too much information and a host of unpronounceable acronyms. 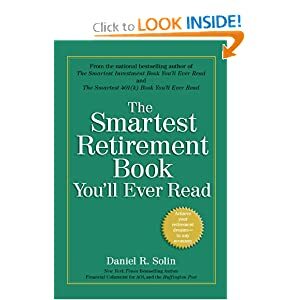 Having said that, I found Daniel Solin’s book, The Smartest Retirement Book You’ll Ever Read, to be a refreshingly easy to understand and well written book. Solin covers a lot of territory, presented in 14 sections containing several very short chapters each. Topics covered range from the shockingly large bite inflation can take out of your nest egg over time, to when to retire and begin drawing Social Security, to irrevocable trusts, and even to prenuptial agreements for seniors. Each topic is covered in concisely written, surprisingly thorough chapters. Most of the chapters are only one-and-a-half to two pages, making for a quick read. Solin supplements these chapters with a section in the back of the book that provides, chapter-by-chapter, references to web sites and other resources for further independent research. Solin’s credentials are excellent. He is the author of two other very well received books, The Smartest Investment Book You’ll Ever Read and The Smartest 401(k) Book You’ll Ever Read. (Sensing a theme here?) He also writes a financial advice column for the Huffington Post and a contributor to AOL’s DailyFinance. Solin’s confidence in his skills comes out clearly in the book: “you need ” this and “you don’t need” that are the kind of definitive word choices he uses when doling out his advice. For some this certainty of opinion may be off-putting; for others, however, it may be reassuring as it gives clear direction on what to do and what not to do. Overall, I think that this is an excellent book to keep in the finances section of your library. It covers a lot of subjects very well and provides a springboard to further research in the ones that are particularly relevant to your individual situation. I still may not “enjoy” reading books like this, but with this one, at least, I learned a lot of very valuable information that I will keep in the back of my mind for when the time comes for me to retire.